The Dark Brotherhood is a guild of assassins shrouded in shadow and mystery which has been active all over Tamriel. While their business is certainly not legal, their existence has typically been tolerated or ignored. Whenever an individual with legal authority takes an interest in their dealings, the Brotherhood relies upon a combination of bribery, blackmail, coercion, and murder to keep their activities hidden. They have been bitter rivals of the Morag Tong since the Second Era. The Brotherhood is also known for their worship of the Dread Father Sithis (personified chaos, also known as the Void). Dark Sisters are accepted into the Brotherhood as equals of Dark Brothers (though members of either gender are often referred to as Brothers). Like any organization, the Dark Brotherhood has some rules that all members must abide by, though the demand to adhere to them can vary with the leadership. These interrelated rules are the Five Tenets: members must never dishonor the Night Mother, betray the Dark Brotherhood, disobey or refuse to carry out an order from a superior, steal the possessions of a Dark Brother or Dark Sister, or kill a Dark Brother or Dark Sister. 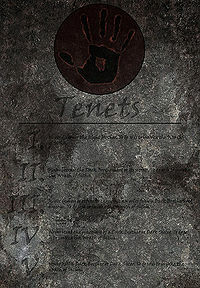 Breaking one of these tenets invokes the Wrath of Sithis, which, it is rumored, is not just a turn of phrase. In extreme circumstances, the purposeful extermination of an entire sanctuary can be ordered. This ancient rite, known as Purification, is carried out by the Black Hand in order to cleanse the Brotherhood of mistrust and treachery, with the souls of those killed offered to Sithis as a symbol of fealty, while hopefully eliminating traitors in the process. In contrast to the Morag Tong's veneration of the Daedric Prince Mephala, the Brotherhood worship the Void – Sithis. However, they see their murders as more of a business, viewing their duty through the lens of economics rather than religion and honor. They are thus frequently viewed as being more pragmatic than the Morag Tong. These differences have caused bitter enmity between the two organizations. The Dark Brotherhood has always been led by the Night Mother. Some stories suggest that the Night Mother is the ghost of the first, who became the wife of Sithis and murdered their five children in his honor. Others say that the title is merely an honorific given to the current leader. Some even consider her to be none other than Mephala, who is commonly thought to be the "Patroness of the Dark Brotherhood". Regardless, the most well-known and infamous method of acquiring the services of the Brotherhood is by performing the Black Sacrament, a profane ritual that purportedly allows those who perform it to be heard directly by the Night Mother. The ritual involves stabbing some actual body parts (including a heart, skull, bones and flesh) within a circle of candles using a dagger rubbed with the petals of a Nightshade plant while whispering the plea, "Sweet Mother, sweet Mother, send your child unto me, for the sins of the unworthy must be baptized in blood and fear". Next in the command hierarchy is the shadowy Black Hand, which is composed of a Listener and four Speakers. The Listener, of course, listens to the Night Mother, and relays her orders to the Speakers, who then dispatch a Brother to make specific arrangements and carry out the murder. Their identities are kept well-hidden, even within the organization. For much of the Brotherhood's history, they have had a special relationship with Argonians, who form a unique sect within the Brotherhood known as the Shadowscales. The Brotherhood usually recruits by directly contacting murderers who show promise, but in the Argonian homeland of Black Marsh, those born under the sign of the Shadow are taken at birth and presented to the Dark Brotherhood. A Shadowscale hatchling is then trained in the arts of stealth and assassination, and lives a life in service to the mighty kingdom of Argonia. 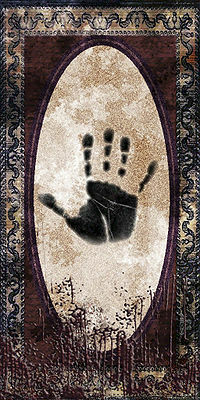 Any Shadowscale who lives to come of age is accepted into the Dark Brotherhood as a full member. If a Shadowscale deserts the Dark Brotherhood, the penalty is death. During the Fourth Era, however, the tradition apparently died out. The Brotherhood's origins are connected with the Morag Tong, though how is a topic still debated by scholars. But it is widely believed that in the year 1E 2920, the Morag Tong assassinated Emperor Reman III, likely at the behest of Versidue-Shaie, his successor. In 2E 324, they evidently assassinated Versidue-Shaie himself, setting off a frenzy among the nobles across Tamriel. The Morag Tong was soon outlawed across the continent. One popular theory holds that the Brotherhood split away for religious reasons. It posits that during the backlash, the Morag Tong appealed to the Tribunal, the highest power in Morrowind at that time, to ensure their existence. Mephala, whom the Tong worshipped as their patron goddess, was seen by the Dunmer as the Anticipation of the Tribune Vivec. The idea is that in exchange for tolerance of their continued existence, the Tong ceased their worship of Mephala in exchange for the worship of Vivec. This is where the break would have occurred - the Morag Tong agreed and worshipped Vivec, also agreeing to limit their activities to the First Era level of traditional inter-House rivalry, whereas the Dark Brotherhood apparently objected to both. 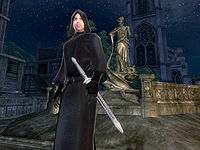 A similar but distinct theory is that, following Versidue-Shaie's assassination and the subsequent persecution of the Morag Tong, Sithis spoke to a former member and demanded the formation of a new guild of assassins, a guild which would worship him, not Mephala, aim to "marry business with death" and better satisfy the Void's hunger for souls. Another story, taken from a purported interview between author Enric Milnes and the Night Mother, says the Dark Brotherhood was an offshoot of the Thieves Guild, not the Morag Tong. Milnes was assassinated shortly after he had it published. This account asserts that, some time in the Second Era, a few members of the Thieves Guild found it efficacious to strangle the occupant of the house when performing a burglary. The woman, who would later become the Night Mother, thought they should formally recognize and allow murder, but the leadership of the Thieves Guild at the time disagreed (and still do), thinking it would be bad for their core business. Undeterred, she founded the murder syndicate which would become the Dark Brotherhood. The connection to the Morag Tong only emerged after the assassination of Potentate Savirien-Chorak in 2E 431, when several Tong assassins quit that struggling organization and joined the upstart syndicate. Who murdered the last Potentate has never been clearly established, though some accredit the Brotherhood with the "accounting" of the Akaviri. In addition to all this conjecture, a rough date for the formation of the Dark Brotherhood has been advanced. In 2E 358, a note addressed to "Brother" was found beneath the floorboards of an abandoned house in the Nordic village of Jallenheim which depicted a war going on between two shadowy organizations. Scholars speculate that this note is a rare piece of evidence about the war between the Morag Tong and the Brotherhood. 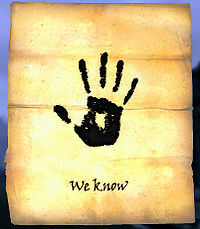 This would make this note the first recorded evidence about the existence of the Dark Brotherhood. About fifty years later, in 2E 412, the Blood Queen Arlimahera of Hegathe wrote a short piece in her journals, mentioning that her family had enlisted the services of the Dark Brotherhood since her grandfather's time. Together with the note found in Jallenheim, this puts the formation of the Dark Brotherhood around 2E 358 or 360 at the latest. In the centuries after the fall of the Second Empire, the Dark Brotherhood showed just how powerful they really had become. During the Interregnum, they prospered in the Gold Coast, killing many notable nobles including the self-declared "provincial governor" of Anvil, Fortunata Ap-Dugal and Primate Artorius of the Order of the Hour. In 3E 41, Tiber Septim's heir, Pelagius I, was murdered by the Dark Brotherhood while praying in the Temple of the One. Circa 3E 325, the Dark Brotherhood was decimated by a vicious internal power struggle. Some suspect that the conflict involved Mehrunes' Razor, an artifact long sought by the Brotherhood because of its ability to kill any target in a single strike. Shortly after this time the Brotherhood had a strong presence in the Iliac Bay region, having a guildhall in almost every town and city by 3E 405. The organization's headquarters at this time was the Nightside Asylum. Before the Warp in the West in 3E 417, an official of one of the cities in the Iliac Bay was close to discovering the Nightside Asylum's secret location. An assassin was sent to dispatch the official, and it was rumored that this assassin was sent by the Dark Brotherhood. In fact, the assassin was actually an adventurer who summoned Mephala and was given this task by the Daedric Prince in return for the Ebony Blade. In 3E 421 a Dark Brotherhood member named Greywyn Blenwyth began his own crusade against the Dark Brotherhood. Believing to have been ordered by Sithis to remove all non-vampires from the Brotherhood, Greywyn founded an organization known as the Crimson Scars. His attempt failed when a member of the Crimson Scars betrayed him to the Black Hand, who swiftly retaliated and murdered the Crimson Scars. The final fate of Greywyn and his supposed sanctuary remains unknown. Due to the pre-eminence of the Morag Tong in Vvardenfell, the Dark Brotherhood had been driven out almost entirely. In 3E 427, the Brotherhood attempted to gain a foothold on the island, but was repelled fiercely by the Tong; the Night Mother, Severa Magia, had taken up insufficiently secret residence on the island, and was assassinated, as were many of the other Brotherhood leaders in the province. Later that year, King Hlaalu Helseth of Morrowind hired the Brotherhood to assassinate the Nerevarine, who he feared might challenge his rule. In response, the Nerevarine tracked down the assassins to their sanctuary in the Manor District of Old Mournhold, and killed their local leader, the fairly high-ranking Dandras Vules. Helseth later explained himself to the Nerevarine. The Dark Brotherhood also made an attempt on Barenziah's life, but the assassins were intercepted by the Nerevarine. In 3E 433 the Dark Brotherhood in Cyrodiil was betrayed from within. Mathieu Bellamont, a trusted Speaker, was secretly attempting to destroy the Brotherhood as an act of revenge for the assassination of his mother. A new member of the Brotherhood quickly rose in rank and became a Silencer of the Black Hand, purifying the Cheydinhal sanctuary and being deceived by the traitor into assassinating most fellow members of the Black Hand. The remaining Speakers, including Bellamont and the newcomer, went to the Night Mother's crypt beneath the Lucky Old Lady statue in Bravil to seek her guidance. There, Bellamont revealed himself, killing two of the four Speakers before being slain by the newcomer. The Night Mother made the newcomer her Listener. The Brotherhood began recovering, but the loss of half its Black Hand and the purification of the Cheydinhal sanctuary left the Cyrodiil branch crippled at the end of the Third Era. The next two hundred years did not treat the Brotherhood well. A combination of external and internal factors not only prevented the Brotherhood from truly recovering, but crippled them further. The Great War strained the organization along with most of Tamriel, and the riots in Bravil, Bruma, and Cheydinhal became significant problems. Several Sanctuaries and bases of the Brotherhood across Tamriel were destroyed or evacuated. The Great War in particular proved costly, as the organization became secondary targets for both major political parties, and their presence in provinces like Hammerfell was eliminated. This made it almost impossible for the Brotherhood to organize contracts in these regions, and further weakened the organization's reputation, power, and influence across the continent. The Shadowscale training facility at Archon in Black Marsh was abandoned, and with no influx of new recruits, the Shadowscale tradition itself began to die out. The Black Hand became divided on the direction of the Brotherhood, with some pushing for expansion while others wanted consolidation. 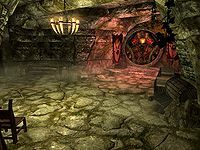 In 4E 186, the Bruma Sanctuary in Cyrodiil was lost with almost no survivors, which served to further disorganize and demoralize the Brotherhood. One by one, other Sanctuaries in other countries and provinces fell. By the end of 4E 187, only four known active sanctuaries remained in all of Tamriel: the Brotherhood's headquarters in the Cheydinhal Sanctuary in Cyrodiil, the Wayrest Sanctuary in High Rock, the Corinthe Sanctuary in Elsweyr, and the Falkreath Sanctuary in the Pine Forest of Skyrim. In 4E 188, Wayrest was attacked by corsairs, and the Sanctuary there was raided and destroyed. The surviving Black Hand leadership shut down the Corinthe Sanctuary and moved its members to reinforce the crucial Cyrodiil faction. The political and social chaos that was engulfing Cyrodiil and the Empire allowed a massive gang war in Bravil to rage unhindered, leading to the death of a few members of the Brotherhood, including the Listener, as well the destruction of the Night Mother's crypt. The sole survivor escaped to Cheydinhal with the Night Mother's stone coffin. 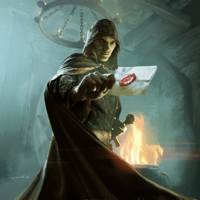 With the Listener dead and no new Listener chosen by the Night Mother, the Dark Brotherhood was forced to rely on word-of-mouth to gather new contracts. 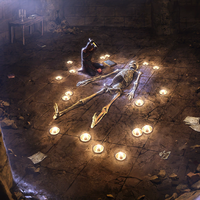 In order to preserve the Night Mother's quickly deteriorating corpse, the surviving Black Hand re-instituted the ancient position of Keeper, who is charged with keeping the Night Mother's corpse intact so that her spirit can remain in Tamriel and speak to the Listener. However, the Night Mother still did not speak, demoralizing the surviving membership in Cheydinhal further, and the Black Sacraments went unheard. Eventually Rasha, the leader of the Cheydinhal Sanctuary and only remaining member of the Black Hand, proclaimed that he was the Listener. However, when he failed to confirm the words that the Night Mother taught to all Listeners and confirmed by all Keepers, he was killed. Soon, the only known remaining member in Cyrodiil was Cicero, the Keeper, who went mad from a combination of isolation, demoralization, and desperation. By 4E 200, only the Falkreath Sanctuary of Skyrim remained active, so Cicero took the Night Mother there. The Falkreath Sanctuary was destroyed around this time, and most if not all of its members killed. It's unknown whether Cicero reached the Sanctuary before its destruction. Some reports out of Skyrim claim the Brotherhood was wiped out. Conflicting reports assert that the Brotherhood not only survived, but succeeded in assassinating the reigning Emperor, Titus Mede II. For game-specific information, see the Brotherhood's articles for Daggerfall, Tribunal, Oblivion, Skyrim, or ESO. This page was last modified on 23 February 2019, at 16:23.